The Next Generation Science Standards (NGSS) and the Framework for K-12 Science Education (NRC, 2012) on which they are based, require a shift in preservice science teacher preparation. NGSS aligned instruction calls to engage learners in the use of authentic science and engineering practices (SEPs) and crosscutting concepts (CCCs) to develop understanding of disciplinary core ideas (DCIs) within the context of a scientific phenomenon (Bybee, 2014; NRC, 2015). To ensure beginning teachers are prepared for this shift, university programs are changing teacher preparation to meet this new vision. This happens primarily in science methods courses where specific supports must be in place to prepare preservice teachers and facilitate course reforms (Bybee, 2014; Krajcik, McNeill, & Reiser, 2008). This paper describes the Next Generation Alliance for Science Educators Toolkit (Next Gen ASET) that was designed to support shifting instructional needs within science methods courses to align with the vision of the NGSS. While not meant to replace existing methods course curriculum, this toolkit promotes dialogue explicit to the vision of the NGSS. Two teaching scenarios demonstrate how the Next Gen ASET Toolkit has been implemented in science methods courses, illustrating its flexibility of and how they accommodate the inclusion of various lesson planning and instructional styles. The Next Generation Science Standards (NGSS) and the Framework for K-12 Science Education (NRC, 2012) on which they are based, require a shift in preservice science teacher (PST) preparation. NGSS aligned instruction calls to engage K-12 students and new teachers in the use of authentic science and engineering practices (SEPs) and crosscutting concepts (CCCs) to develop understanding of disciplinary core ideas (DCIs) within the context of a scientific phenomenon (Bybee, 2014; NRC, 2015). Therefore, it must be modeled for PSTs how to weave together these three dimensions in the classroom, as they will be expected to align instruction with these goals as they begin their teaching careers. At the university level the instructional shifts required to align teacher preparation to meet the vision of the Framework and NGSS are most likely to happen within teacher credentialing programs by revising or replacing some of the components of the science teaching methods courses (Bybee, 2014). Yet to accomplish this, science education faculty leading these efforts require tools or supports that assist PSTs to explicitly unpack standards and illuminate their underlying components (Krajcik, McNeill, & Reiser, 2008). Tools that have undergone systematic analysis and field-testing in real education contexts are required for facilitating such understanding (Bryk, Gomez, Grunow, & LeMahieu, 2015; Lewis, 2015). The Next Generation Alliance for Science Educators Toolkit (Next Gen ASET) presented in this paper was designed to provide such scaffolds to prompt discussion and lesson planning that align with the goals of the NGSS. The toolkit and examples of its integration into science methods courses are featured here. Science educators, scientists, and curriculum specialists worked collaboratively over the course of three academic years to develop the Next Gen ASET Toolkit and integrated these tools into science methods courses across six universities. The Improvement Science (IS) framework (Berwick, 2008; Bryk et al., 2015; Lewis, 2015) informed the design of this study in developing and revising the toolkit in methods courses over this 3-year period. This approach allowed for an iterative design process that involved feedback from both the practitioner and end-users as well as for revisions of the tools as they were implemented as part of instruction. The Next Gen ASET Toolkit is designed to support science methods course instruction to shift towards NGSS-alignment. This includes consideration of how to effectively integrate the three dimensions outlined in the Framework (NRC, 2012) while still considering other effective instructional practices in science education that are commonly addressed in methods courses. 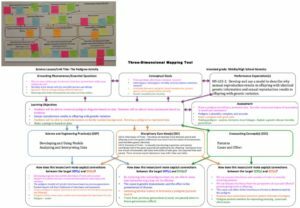 The toolkit consists of a one-page overarching graphic organizer (3D Map) and a set of eight tools with guiding criteria to support understanding of the individual SEPs (SEP Tools). A digital version of the toolkit was created to further support its use in methods courses (https://www.nextgenaset.org). The website provides access to the most current versions of the 3D Map and SEP Tools as well as descriptions and supports specific to the use of each. The tools are not meant to be used in isolation, but with peers to promote discourse for understanding the goals and aligning instruction for the NGSS. When used as part of a science methods course with direction from the instructor, these tools can support PSTs to align instruction to the NGSS vision. 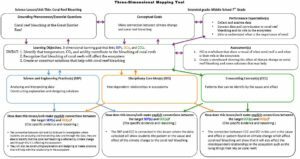 The following sections further describe the 3D Map and SEP Tools, followed by examples of how these have been used in methods courses. 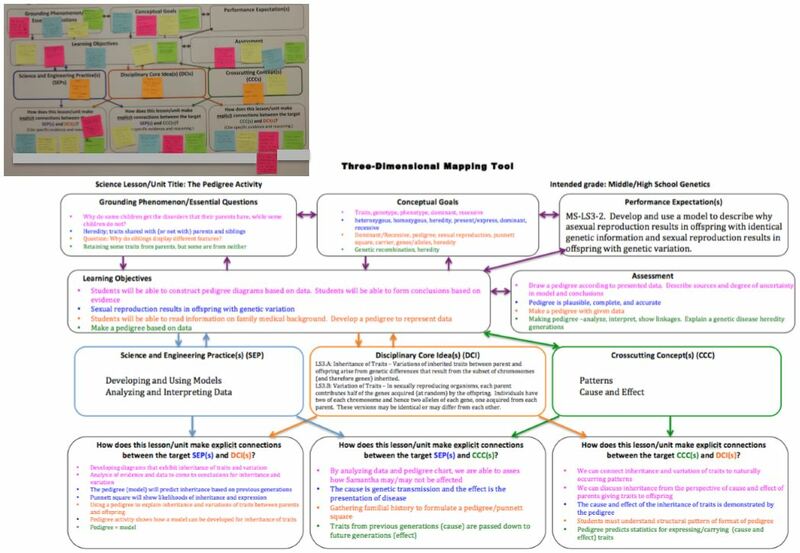 The 3D Map (Figure 1) was developed as a one-page graphic organizer to help ground discussions of curriculum and instruction in the dimensions of the NGSS, while linking these to larger topics generally discussed as part of instructional planning in a science methods course. The inclusion of topics outside the three dimensions of NGSS as part of the 3D Map extended beyond simply identifying the standards being used in a lesson, and to make connections of how these can be effectively aligned with instructional practices in the science classroom. The 3D Map was not intended to replace the use of more traditional lesson planning templates or other supports, but instead complement and provide a structure for making explicit the ways in which a lesson or unit integrates the components of NGSS. The 3D Map allows enough flexibility in its use to accommodate consideration of existing teaching strategies typically included in a methods course. The 3D Map is arranged with four rows of boxes, each labeled with an instructional component to be considered with room for notes or description of how each of these elements is addressed in a given lesson or unit. The top two rows of boxes on the 3D Map link to larger topics generally discussed as part of lesson planning in a science methods course and arose from consideration of how this tool would integrate with the other course topics. The bottom two rows of boxes include each of the three dimensions of NGSS and spaces for describing how these three dimensions are connected within a lesson or unit. The individual boxes are connected with arrows to indicate relationships between elements with respect to lesson or unit planning. 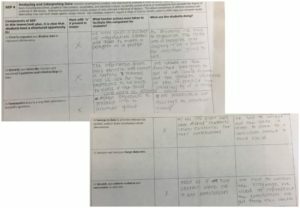 The top row of boxes includes elements to help orient PSTs and identify the context, goals, and boundaries of a lesson or unit. From left to right this top row has boxes for “Grounding Phenomenon/Essential Question,” “Conceptual Goals,” and “Performance Expectations.” The placement of the “Grounding Phenomenon” box in the upper left corner of the map was intentional, to prompt users to explicitly consider phenomena at the beginning of the planning process, and to promote anchoring lessons to a natural phenomenon while examining existing science instructional segments or planning for new ones. Given that a phenomenon serves as the driver of the science lessons (NRC, 2012), teacher preparation programs need to include a focus on developing teachers’ abilities to engage their students in explanations of natural phenomena (Kloser, 2014; NRC, 2015; Windschitl et al., 2012). The separate box for “Conceptual Goals” was included to allow users to translate this visual phenomenon they planned to explore into a scientific context. The third box, “Performance Expectation(s)” was included to prompt consideration of these larger learning goals as defined by the NGSS. 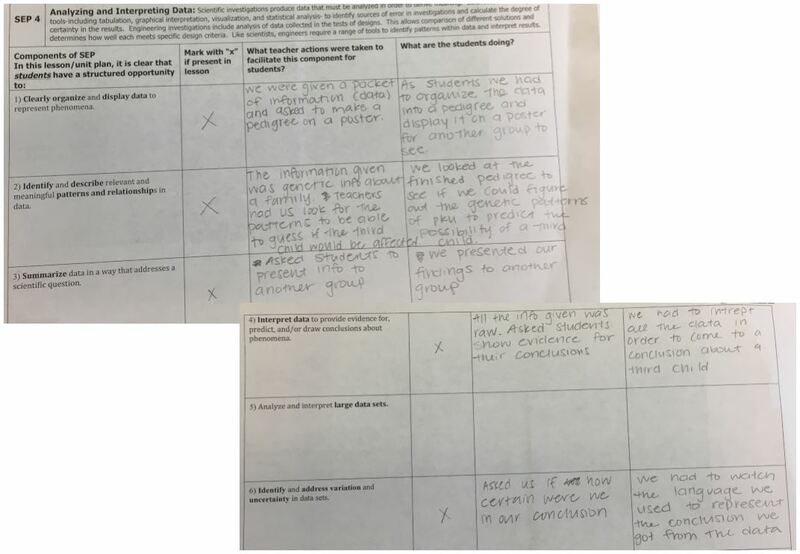 The second row of boxes prompts the identification of “Learning Objectives” and “Assessments.” The inclusion of a box labeled “Learning Objectives” separate from the “Performance Expectation(s)” (PEs) box was purposeful. The intent was to signal PSTs to consider the relationships and differences between this larger benchmark for proficiency in science (i.e., PEs) and the smaller lesson-level learning goals in an instructional segment (Krajcik et al., 2014). Current literature indicates that PEs as written in the standards are not meant to be used as lesson-level learning goals (Bybee, 2013; Krajcik et al., 2014); “many lessons will be required for students to develop skills to reach proficiency for a particular NGSS performance expectation” (Houseal, 2015, p. 58). The separate box “Learning Objectives” was therefore included to prompt PSTs to write more specific learning goals based on, but more narrow in scope than, the PEs. The “Assessment” box was included to align with the structure of backward design (Wiggins & McTighe, 2001), an important component of many methods courses, and utilized within the course the 3D Map was originally developed. Consideration of assessment was intended to support PSTs to develop understanding of how to effectively assess learning goals for a lesson or unit, a key component of planning effective instruction (Davis, Petish, & Smithey, 2006). While the assessment box has an arrow connecting with the box for learning objectives, it does not make a connection with the larger PEs since the goal was to include assessments specific for the lesson or unit level, not these larger goals defined by the NGSS. The bottom two rows of this graphic organizer consist of boxes for PSTs to list specific components of each NGSS dimension present in the lesson or unit, and then to describe how connections among the dimensions were made explicit (NRC, 2012). This design mirrors the integration of the three dimensions provided in the Framework and the NGSS and is consistent with literature providing the rationale for explicating connections among the dimensions for both content and learning objectives (Houseal, 2015; Krajcik et al., 2014). The structure includes color-coding to match the representation of SEPs in blue, DCIs in orange and CCCs in green. The colors of the boxes for the three dimensions of the NGSS and associated connecting arrows were chosen to align with the colors used by Achieve in the NGSS (NGSS Lead States, 2013) to provide a visual connection back to the standards. The visuals and discrete boxes in the 3D Map promote a constructivist approach to co-creating a group understanding of the shifts in pedagogy and curricular structure necessary to implement the integrated and complex components of the NGSS. Figure 1 (Click on image to enlarge). Three-dimensional mapping tool. The SEP Tools (see Figure 2 for example) were developed for use in conjunction with the 3D Map to help PSTs identify specific components of a SEP to hone objectives in a given lesson or unit. At first glance the eight SEPs outlined in the NGSS appear straightforward to many PSTs. However, the description of each SEP in the Framework (NRC, 2012) presents a much more complex vision. The goal of the SEP Tools is to make this complexity more explicit. A brief description is provided at the top of each SEP tool as defined in the Framework (NRC, 2012). Below this description, the tool lists separate subcomponents that classroom students should experience in structured opportunities across the 6-8 grade band in order to completely engage in that SEP. These components are arranged on the left side of a matrix with columns to the right where PSTs may indicate which of these components from a given SEP are present in a lesson. There is also space on the tool to describe evidence of each component, including the actions a teacher takes to facilitate these components as well as how the students are engaging in each. This matrix for completion by the PSTs detailing the SEP subcomponents is formatted to fit on 1-2 pages depending on the number of subcomponents. The criteria included on the last page of each SEP Tool is meant to be a reference for each component, defining for PSTs what students should do to have a structured opportunity to develop an understanding of each component by the end of the 6-8 grade band, as described in the Framework (NRC, 2012). Figure 2 (Click on the following link to view). Science and engineering tool example. In this section, we describe examples of how the tools have been implemented within science methods courses at two different public universities. Each of these courses enrolls PSTs who are completing requirements to teach science at the secondary level (grades 6-12). The two scenarios demonstrate the flexibility of the tools as each instructor implemented them in different ways but with the same overarching goal of promoting PSTs’ discussion and understanding of three-dimensional lessons. (Note: some of the 3D Map samples differ in their labels from one another as they were used at different stages in the three-year process of designing the 3D Map). This first example describes how the Next Gen ASET Toolkit was incorporated into a yearlong science methods course. The instructor had previously explored ways to incorporate the three dimensions of the NGSS into her course but reported that her students lacked the support to make connections across the dimensions, particularly within the context of a phenomenon. The course maintained its existing pedagogical strategies such as the 5E learning cycle, backward design, and science literacy approach (Bybee et al., 2006; Lee, Quinn, & Valdes, 2013; Wiggins & McTighe, 2001), but then focused the NGSS themed discussions via the toolkit. In this case, the instructor began with the 3D Map to frame the larger picture of the NGSS, and then introduced the SEP Tools later to explore the complexities of the practices within a three-dimensional context. During the first few weeks of the course, the PSTs were introduced to the following overarching phenomenon: consider the yearly weather and temperature differences between two cities residing on the same latitude approximately 150 miles apart. One city is inland, the other on an ocean coast. The instructor then modeled lessons which could be used in a middle or high school classroom to explore this phenomenon. Throughout this process, the instructor referred to a large, laminated version of the 3D Map. As the PSTs learned about the 3-dimensions of the NGSS (PEs, SEPs, DCIs, and CCCs), and related concepts of phenomena and essential questions, the instructor noted how these are integrated using the 3D Map. 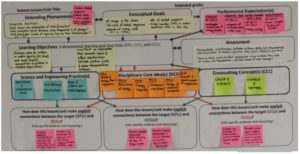 As new phenomena were introduced (such as ocean acidification), PSTs were challenged to add their own ideas of how model lessons incorporated components of the NGSS by gradually adding colored sticky notes into the related sections of the 3D Map on the wall (See Figure 3). This allowed PSTs to engage in making their own connections between sample activities and lessons modeled in the methods class to the boxes on the 3D Map. Throughout the course, PSTs continued to add other sticky notes to the 3D Map to illustrate the multiple layers and interconnectedness characteristic of a larger instructional segment aligned with the goals of the NGSS. Figure 3 (Click on image to enlarge). Course example 1 classroom 3D map. Using the 3D Map in this way was also beneficial in that it allowed the instructor to understand where her PSTs struggled with NGSS. For example, regarding the phenomenon of the two cities described above, the PSTs identified the following performance expectation as relevant: MS-ESS2-6. Develop and use a model to describe how unequal heating and rotation of the Earth cause patterns of atmospheric and oceanic circulation that determine regional climates. However, when pressed to modify their own statement of a phenomenon related to this instructional segment, the PSTs overwhelmingly responded with “properties of water.” The instructor noted in her reflections with the research team how this demonstrated PSTs’ focus on content with little connection to the larger phenomenon intended. In addition, she cited that the PSTs struggled to indicate how the lessons engaged in specific components of a SEP including data collection, identifying patterns, creating flow charts as descriptions of energy flow, and identifying connections between climate and location of cities. Therefore, she found they required prompting in a more specific manner; this is where the SEP Tool for Analyzing and Interpreting Data became useful for focusing specific student actions aligned with unit objectives and therefore relevant assessments. A unit plan was used as a culminating assessment for the PSTs to demonstrate their ability to utilize the tools. 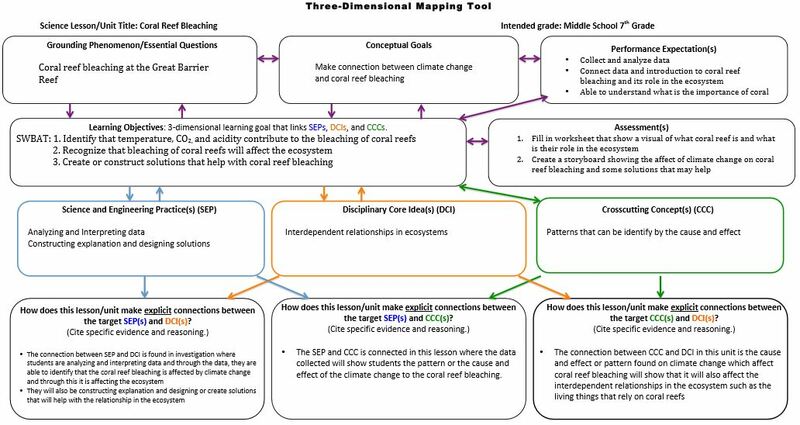 Teams used the 3D Map to plan an interdisciplinary unit related to climate change topics where specific data collection activities were highlighted with emphasis on the SEPs: Analyzing and Interpreting Data and Constructing Explanations. For instance, one group designed a unit to investigate the phenomenon of coral bleaching (See Figure 4). As PSTs planned, they utilized the 3D Map to guide the structure of their unit: identifying a particular phenomenon, choosing relevant conceptual goals related to that phenomenon (e.g., ocean acidification, pH changes, carbon cycles, impact of acidification on shelf-forming animals), associated and bundled Performance Expectations; related SEPs that would support the concepts and phenomenon (e.g. collecting and analyzing data from live and archived online estuary stations); chose DCIs that integrated life and physical sciences (LS2.B: Cycle of Matter and Energy Transfer in Ecosystems; PS3.D: Energy in Chemical Processes and Everyday Life; LS2.C: Ecosystem Dynamics, Functioning, and Resilience) and applied appropriate, transcending connections found in at least one CCC (i.e. Cause and Effect) – all of which translated into various formative and summative assessment opportunities aligned to unit objectives. Figure 4 (Click on image to enlarge). Course example 1 coral bleaching student map. This second example describes how the Next Gen ASET Toolkit was incorporated into a 1-semester (16 weeks) science methods course. While the course had previously emphasized curricular methods that were hands-on and followed the inquiry approach to teaching science, inclusion of NGSS beyond simply stating the architecture, which provided a surface level introduction, had not yet happened. The course instructor decided to use the SEP Tools in class during the first few weeks to facilitate reflection and discussion, and then introduce the 3D Map later in the semester. During the second week of class, PSTs engaged in a traditional lesson around scientific inquiry, working to construct a model of what might be happening inside an opaque box. During this lesson, the PSTs worked in small groups to investigate what was inside a given set of black plastic boxes. After completing the activity, the PSTs were given the SEP Tool for Constructing Explanations. They selected which of the subcategories this activity engaged them in and used this tool to guide discussion in small groups and then as a larger class. 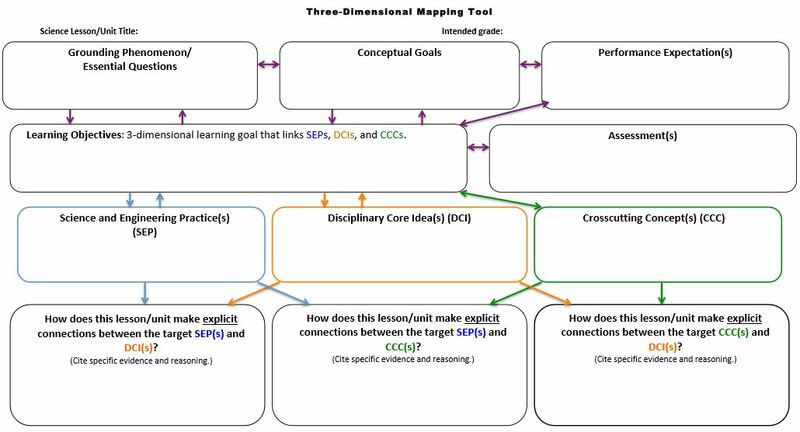 After using this SEP Tool, during the following class meeting PSTs were given a brief overview of the NGSS architecture and vision for connecting three dimensions in learning. Focus was given to the SEPs when first introducing the NGSS. It was also discussed how some of these traditional lessons around inquiry do not truly integrate elements of each dimension and how these might be modified to allow for exploration of a DCI using these SEPs. In the following weeks the instructor went into more depth with these PSTs about the other dimensions of the NGSS as well as overarching instructional goals. During the eighth week of class PSTs were shown the 3D Map. At this point in the course they were familiar with the NGSS and its dimensions. They had also spent time learning about how to write learning objectives and instructional strategies in science aligned with inquiry methods. At this point, the instructor spent two hours in class engaging the PSTs in a model lesson on genetics. The PSTs participated as the students would in the lesson. Groups of PSTs were given various family histories based on genetic counseling interviews. The PSTs were provided some instruction on how to construct a pedigree and then tasked to use the information provided about their given family and construct a pedigree to determine what information they would tell this family if they were a genetic counselor working with them. Within the context of the pedigree sample lesson, the SEP tool for Analyzing and Interpreting Data (see Figure 5 for example) was used to help guide discussion of what is considered data in science and how scientists work with data. The instructor first prompted the PSTs to read the subcomponents listed and indicate which of these they felt the lesson included, supported with evidence of these components in the lesson. The instructor pointed out multiple times that although each SEP had multiple subcomponents, the goal of a given lesson was not to include all of these but instead to practice and assess one or two of them. Figure 5 (click on image to enlarge). Course example 2 student SEP tool. After this discussion of the SEP, a laminated version of the 3D Map was revealed to the class. The instructor reviewed how each box on the map related to the NGSS or larger ideas around lesson planning in science. The PSTs were then given sticky notes (each group a different color) and told to use these to put their group’s ideas for each box onto the map. The instructor had put notes for the NGSS standards and PE to focus students’ time on discussion of how these were connected in the lesson as well as related ideas on the map. At the end of this class period the laminated 3D Map was full of sticky notes indicating each group’s contribution by color (Figure 6). Figure 6 (Click on image to enlarge). Course example 2 classroom 3D map. The following class period, approximately 90 minutes were spent discussing the different groups’ responses on the 3D Map. Much of the discussion centered on the phenomenon, conceptual goals, and how the three dimensions of the NGSS were linked in the lessons (bottom row of boxes). The use of the 3D Map guided the PSTs to think about how different elements of the NGSS and lesson planning needed to be considered when planning instruction. While no “best response” was given by the end of the discussion, PSTs expressed consideration of how multiple ideas presented from the sticky notes might help connect dimensions as well as increased confidence in understanding the vision of designing lessons to explore content around a given phenomenon. Following this discussion using sticky notes, the 3D Map was placed on the wall in the classroom and referred to as the class continued to explore exemplar lessons and dimensions of the NGSS. As in the first scenario, PSTs in this course completed a culminating assessment of a lesson sequence that included completion of a 3D Map. The PSTs in this course completed this assignment individually, with some time in class given to share ideas and critique phenomenon identified for their lessons. This quote suggests that integrating the Next Gen ASET Toolkit into this course not only supported PSTs’ understanding of the NGSS, but supported the faculty instructor in making his own teaching strategies related to NGSS more explicit. While the two examples described start with the use of different tools, they each demonstrate the flexibility of these tools for their use with a variety of model lessons. The promotion of discourse was inherent in the purposeful design of the 3D Map and the SEP Tools. 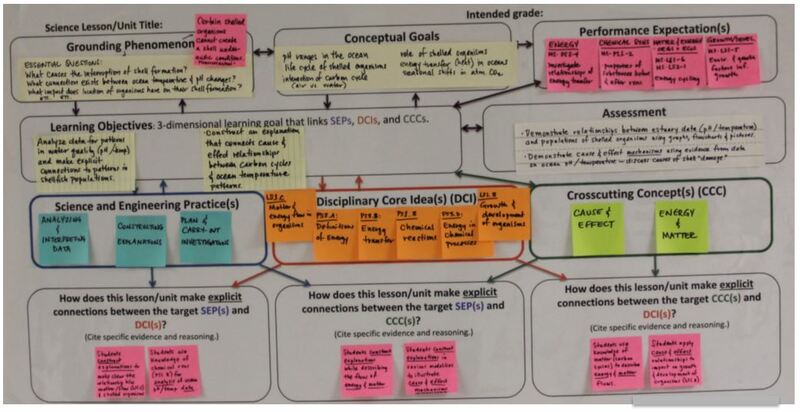 Without the visual scaffold and the ability to make notes on a large laminated 3D Map, or on large handouts in the methods classroom, the complex conversations around planning for the NGSS would be lost in a disconnected set of activities and course assignments. In the first scenario, the larger vision of NGSS represented by the 3D Map was presented first and then followed with exploring the complexities of the practices through use of the SEP Tools. For instance, activities related to the ocean as a heat reservoir (activities and lessons including models of ocean currents, wind patterns, weather patterns, thermal expansion of water, etc.) initially were perceived by PSTs as isolated activities to illustrate a limited number of concepts. However, conversations guided by the 3D Map framed the phenomenon of temperature differences between a coastal and an inland city at the same latitude; PSTs began to understand the connections instruction should make to connect a series of lessons to support this phenomenon. In the second scenario, focus was given to the complexity of the SEPs first and then expanded to the 3D Map, including the larger picture of how to align science instruction with the NGSS. In this case, the SEP Tools helped to demonstrate how the practices can be used in different ways depending on the lesson. For example, in the pedigree activity, at first many PSTs did not think of qualitative data as data that students would use for analysis. However, through their discussion, framed by the SEP Tool for Analyzing and Interpreting Data, PSTs were able to focus on the various ways that they engaged with data in this way. The visual 3D Map and the SEP Tools allowed for discussion of the various ways to make these connections clearer, made assessment possibilities more salient, and reinforced the relationships between doing science (SEPs) and understanding the concepts (DCIs) through specific lenses that link the domains of science (CCCs) serving as ways to assess overarching connections related to a given phenomenon. As is demonstrated in the examples, the role of the instructor was essential to guide this discussion for PSTs. As the instructor highlighted essential elements and relationships on the tools, PSTs were supported to make connections between course activities and the vision of the NGSS. Previous attempts to make broad and unstructured connections between model lessons and the NGSS dimensions were not as successful for either instructor. The first instructor lacked the support to make these explicit connections and the second instructor had only made surface level connections to the architecture with no depth to the vision for instruction aligned to the NGSS. Integration of these courses with the Next Gen ASET Tookit made elements, which had been implicit, much more explicit to PSTs. They provided the structure and support needed to prompt meaningful discussions with appropriate scaffolds. The Next Gen ASET Toolkit is not meant to be separated into stand-alone tools but are meant to be used as part of a larger course that together with exemplar lessons and dialogue, support understanding of the complexity of planning for the NGSS, guided by the course instructor. These tools should not simply be handed to an instructor without support since they may not know how to effectively integrate these tools to support discussion or themselves may be unprepared/untrained in how to align instruction to the NGSS. The current website provides some support for implementing these tools. These limitations show the importance of using the Next Gen ASET Toolkit while also participating in discussion with other methods course instructors and other individuals who understand how to effectively align instruction to the NGSS. This paper reports on the first three years of our five-year study as the Next Gen ASET Toolkit was developed and implemented. The toolkit is currently being implemented in science methods courses across five of the original six university campuses. The faculty member at the sixth campus, due to commitments on other projects, is not currently able to teach the methods course at the university. Each of these courses includes a culminating activity for PSTs to generate a lesson sequence or unit plan, using the 3D Map to help guide the development. In each course, the SEP Tools and 3D Map are utilized to help promote and support discussion around the NGSS. Instructors from each campus meet via videoconference monthly and discuss the progress of instruction via use of the tools by sharing data collected on student artifacts and course activities. The project team is currently expanding this network to include more campuses to engage in research using these tools. This expansion includes exploring the use of these tools with inservice teachers as well as with university supervisors to support the reflective dialogue happening as they observe PSTs’ field-experiences. The instructors currently implementing the Next Gen ASET Toolkit report that these tools assist their PSTs in developing lessons that integrate the three-dimensionality and complexity of the NGSS. During monthly videoconferences these instructors share results from their courses and suggestions for how to improve instruction. These instructors are also involved with considering any further improvements to the tools based on results from their use in the courses. The toolkit shows promise to be an example of the tools that have been called for to assist PSTs in explicitly unpacking these standards and illuminate their underlying components (Krajcik, McNeill, & Reiser, 2008). The university courses currently implementing the Next Gen ASET Toolkit are shifting instruction within methods courses to align their teacher preparation program to meet the vision of the Framework and the NGSS (NRC, 2012). Integration of these tools into a methods course alongside exemplar lessons allows for the instructor to make explicit connections to the NGSS. The 3D Map allows for a visual scaffold and dialogue of how the lesson or lesson sequence integrates dimensions of the NGSS. The 3D Map also allows PSTs to visualize the variety of components necessary to consider in creating effective lessons aligned to the NGSS. The SEP tools provide explicit ways for the instructor to convey the complexities of each of these practices as well as guiding PSTs to consider how they will best include these in their own lessons. While this toolkit is not meant to be used in isolation, when used to promote discussion and reflection alongside model lessons it has shown promise to allow instructors to shift their instruction to support students understanding of the NGSS. We thank the National Science Foundation who supported the research reported in this paper through a Discovery Research K12 grant, Award No. DRL-1418440. Thank you to our faculty partners who implemented this toolkit in their courses and support the research efforts: Jennifer Claesgens, Larry Horvath, Hui-Ju Huang, Resa Kelly, Jenna Porter, Donna Ross, David Tupper, Meredith Vaughn, Lin Xiang. Thank you also to the many preservice teachers who provided feedback on the tools as they were implemented in their instruction. Berwick, D. M. (2008). The science of improvement. Jama, 299, 1182-1184. Bryk, A. S., Gomez, L. M., Grunow, A., & LeMahieu, P. G. (2015). Learning to improve: How America’s schools can get better at getting better. Cambridge, MA: Harvard Education Press. Bybee, R. (2013). Translating the NGSS for Classroom Instruction. Arlington, VA: NSTA Press. Bybee, R. W. (2014). NGSS and the next generation of science teachers. Journal of Science Teacher Education, 25, 211-221. Bybee, R. W., Taylor, J.A., Gardner, A., Van Scotter, P., Powell, J. C., Westbrook, A., & Landes, N. (2006). The BSCS 5E instructional model: Origins and effectiveness. Colorado Springs, CO: BSCS, 5, 88-98. Davis, E. A., Petish, D., & Smithey, J. (2006). Challenges new science teachers face. Review of Educational Research, 76, 607-651. Houseal, A. (2015). A visual representation of three-dimensional learning: A tool for evaluating curriculum. Science Scope, 39(1), 58-62. Kloser, M. (2014). Identifying a core set of science teaching practices: A delphi expert panel approach. Journal of Research in Science Teaching, 51, 1185-1217. Krajcik, J., Codere, S., Dahsah, C., Bayer, R., & Mun, K. (2014). Planning instruction to meet the intent of the Next Generation Science Standards. Journal of Science Teacher Education, 25, 157-175. Krajcik, J., McNeill, K. L., & Reiser, B. J. (2008). Learning goals driven design model: Developing curriculum materials that align with national standards and incorporate project based pedagogy. Science Education, 92, 1-32. Lee, O., Quinn, H., & Valdez, G. (2013). Science and language for english language learners in relation to next generation science standards and with implications for common core state standards for english language arts and mathematics. Educational Researcher, 42, 223-233. Lewis, C. (2015) What is improvement science? Do we need it in education? Educational Researcher, 44, 54-61. Wiggins,G., & McTighe, J. (2001). Understanding by design. Upper Saddle River, NJ: Prentice Hall. Windschitl, M., Thompson, J., Braaten, M., & Stroupe, D. (2012). Proposing a core set of instructional practices and tools for teachers of science. Science Education, 96, 878-903.